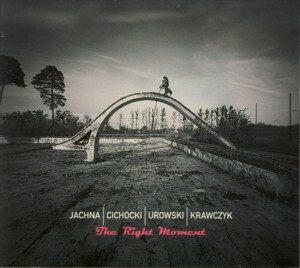 This is the debut album by a Polish Jazz quartet comprising of trumpeter Wojciech JachnaFind albums by this artist, pianist Jacek CichockiFind albums by this artist, bassist Pawel UrowskiFind albums by this artist and drummer Mateusz KrawczykFind albums by this artist. The quartet performs nine original compositions: three by Cichocki, two each by Urowski and Jachna and another two co-composed by all four members of the quartet. Saxophonist Wojciech Piorkowski guests on one track. The music is a typical contemporary modern Polish Jazz, somewhat more "conventional" than what one might expect from such names as Jachna and Urowski, but nevertheless excellent. This musical environment serves as a perfect opportunity to hear Jachna play more melodically than on most of his recordings, showing one more of his excellent qualities as a trumpeter. The atmosphere of this recording and the music bring a fond memory of the modern Polish Jazz period of the 1960s, especially the revolutionary Krzysztof Komeda and Tomasz Stanko recordings. All the tunes herein have the same melancholic touch of Polish lyricism, which was so archetypal of that period, and which makes them sound quite "retro". It is difficult to say if this effect was intentional, but regardless of the actual intentions, the "spiritual" similarity is very apparent. The performances are, as expected, excellent from start to finish and although Jachna´s trumpet is the most evocative instrument, all four members of the quartet are superb instrumentalist and the quartet plays together like a dream, even when the music gets to be complex and demanding. Cichocki, whom I have not heard earlier, is especially impressive as a newcomer and I certainly hope to hear a lot more of him in the future. Overall this is a superb album, which definitely stands among the best achievements of the current year, even if it is not especially innovative or groundbreaking. Such music continues a tradition that is worth preserving invigorates it and refreshes it with new creative powers. These still relatively young musicians are already the main creative power of the Polish Jazz scene, and the next generations are already puffing on their necks. These are good times for Polish Jazz and it´s great to be alive while they last!